Has anyone written up stats for these? I still maintain the HWK-290 is better served by having concussion missiles (advanced or not) available. Perhaps the solution is to make a versatile launcher that may fire a few different types of ordnance (the TIE class had this down to a science). This would of course depend on who stocked it and who is driving and what the mission is. Most missions gone into blindly I would stock regular concussion missiles, maybe two advanced if something funky shows up. Against transports+, you bet I'd be on the proton plan! Then you are perfectly welcome to write up your own stats or modify these to suit your preferences. I, however, chose to write the stat with a proton torpedo launcher to integrate with an extensive and intricate rule system that has moved far beyond the theory and planning stages, and I am disinclined to change it without a compelling reason. Oh, I didn't mean to imply that your write-up wasn't awesome as-is. I was throwing ideas out there for discussion, rather than telling you HEY MAN CHANGE THIS! Click, and the link shall be opened unto thee. I understand. I was just clarifying that I did what I did for a reason, but no one is required to use my stats without modification. If it suits the needs of your campaign that the ship be fitted with Concussion missiles, then feel free. I just won't be changing it here. As far as what types of ships can carry a broad array of ordnance, I pretty much restrict it to the TIE Bomber and other late-model TIEs like the Advanced x1, the Avenger and the Defender. Called the Multi-Warhead Launcher, it's state-of-the-art tech and only fitted to Imperial ships as of the Classic Era. For Alliance and other non-Imperial starfighters, if they want to carry a mix of missiles, torpedoes and / or bombs, they must carry a launcher for each type. Someday, when I win the lottery, I will focus all my attention on completing it. Until then, I must complete what work I can during breaks between long hours of driving a big-rig up and down the interstate. TIE Fighter is one of my favorite video games ever, if not the favorite. In particular, I loved flying TIE Defenders and Assault Gunboats. Has anyone written up stats for the so-called Multi-Warhead Launcher? It would be a really dope (and accordingly back-breakingly expensive) addition to almost any craft that could support and make use of it. (My first guess would be that this would be a short list of some fighters (TIE Advanced x1 and larger, then transports and some capital ships). I am in agreement with you that only certain ships in the TIE line are suited to carry such a launcher as they are right off the production line. Fitting one such launcher to a B-Wing, for example, would require a team of people and some very difficult to heroic rolling. As well as access to the durned thing to begin with. Funny story: A while ago, a friend of mine convinced me to try out the X-Wing tabletop space combat game. We played a 50-point game (most are 100+). I asked for a TIE Defender and some other cheap ship to fill out my 50 points. The Defender dominated the entire scene. I lost my second ship really quickly, but the Defender just outmaneuvered and outflanked like an F-16 on steroids. It was hilarious. It echoed memories for me of maintaining space superiority easily in TIE Fighter if myself (and preferable 1-2 wingmen) survived the initial clash. I repeat, you really, REALLY need to read my Advanced Starfighter Combat System. The Multi-Warhead Launcher exists there, but not in a form that can be transplanted into a space transport; a starfighter either has one or it doesn't. Considering the B-Wing already carries two 8-round proton torpedo launchers (which have the greatest versatility of ordnance types in my system), I would be more inclined to install something like that on an upgraded X-Wing or a Y-Wing replacement (I picture a SoroSuub Preybird, 1-2 years after the Battle of Endor). I know of one other person here in the Pit who has gotten into the X-Wing / Armada game, but I mostly just mine their stuff for ideas. SWD6 is my primary interest by far. Stealing schematics is not automatically gonna mean they can duplicate it.. Especially in cases where special gear/metals/machinery etc is needed..
Until then, I must complete what work I can during breaks between long hours of driving a hot-dog up and down the interstate. You drive the Oscar Meyer Weiner Mobile?!? AWESOME!!! I f*** HATE Android's auto-correct function. That's why I disable it, first thing, with any phone I get. I'll make errors, but they'll be MY errors. I figured you meant big-rig, but I couldn't resist making the weiner mobile comment. That's the official explanation for why Kyle Katarn crashed the Moldy Crow while escaping from the Sulon Star crash. Notice Jan Ors was always wearing goggles, and always had them over her eyes while flying the Crow. Kyle didn't have them, so he couldn't see the rock outcropping in the Crow's path and crashed into it. Late to the party in seeing this, but thank you for fixing all that was wrong with this ship, what with its impossible Tardis-like cargo capacity, etc. Had no idea that the obscured lines of sight for the cockpit were used as the official explanation for the crash! on the highway, your driving'd have to have a little mustard on it. I don't recall where I read it; I distinctly remember seeing the reference in an official source somewhere, but now I can't find it. 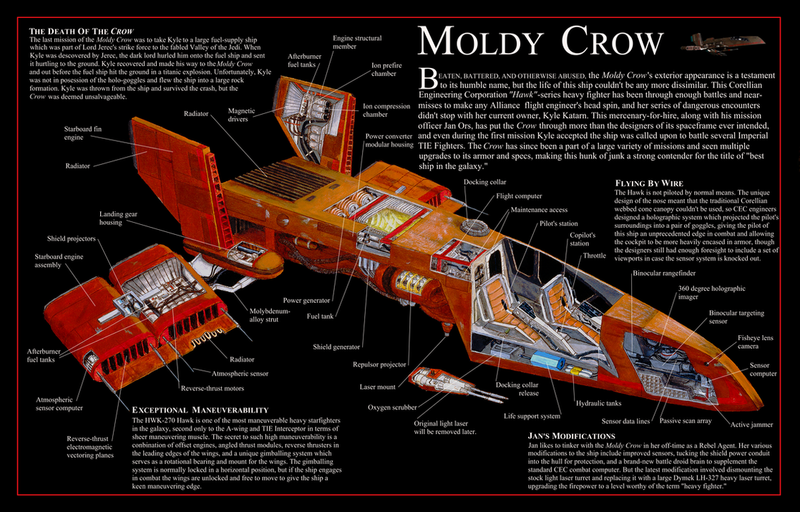 Regardless, it makes sense with the design of the ship, as well as the circumstances of the Moldy Crow's crash in the video game. Oddly enough, aircraft with no forward view have historical precedent. Charles Lindbergh's Spirit of St. Louis only had side windows, with a periscope for forward views. Incidentally, I did finally locate the source for the "no forward view without holo-goggles" rule. It wasn't official, but was, instead, a Deviant Art write up of a fan-made Incredible Cross-Sections take on the HWK-290. However, in spite of it not being official, it still makes a good deal of sense, so I'm keeping it.